Samsung was the company that created the phablet category. And the Korean company launched a foldable phone called Galaxy Fold a few weeks ago, ushering the world into the era of foldable smartphones. Since then, many other Android vendors such as Huawei, Oppo, and Xiaomi have either unveiled or teased their foldable devices. Apple was late to join the phablet bandwagon, and it will in all likelihood be late to the foldable phone party. But what would a foldable iPhone look like when it comes out, if ever? 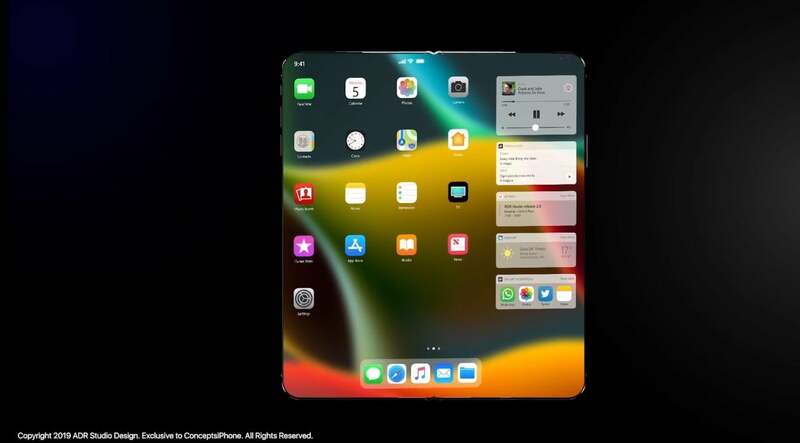 A concept designer has come up with an exciting iPhone X Fold concept to imagine the foldable iPhone of the future. The concept was designed by Singapore-based designer Antonio De Rosa and was shared on YouTube by ConceptsiPhone. The iPhone X Fold concept adheres to Apple’s minimalist design language. It looks sleeker than Samsung’s bulky Galaxy Fold. But then Galaxy Fold is a real device while this is just an imagination of a designer. When unfolded, it looks like the designer has put two iPhones side-by-side and merged them. It has a full-screen external display measuring 6.6 inches. When unfolded, you get a giant 8.3-inch tablet-like display. By comparison, the Galaxy Fold has a 4.6-inch external display and a 7.3-inch foldable screen. The iPhone X Fold concept gets a Super Retina display with a pixel density of 514ppi. The designer has also depicted how Apple could optimize the iOS software for its foldable iPhone. When the device is unfolded, the home screen has enough room to accommodate a bunch of widgets on the right side of the display. The widgets give you quick access to Weather, Music, and other features. According to Antonio De Rosa, the iPhone X Fold concept phone costs a staggering $2,000, which is twice as much as the iPhone XS flagship. Samsung’s Galaxy Fold costs close to $2,000 because foldable phones are expensive to manufacture. So, don’t expect Apple’s foldable device to be affordable. Apple may not launch a foldable iPhone this year, but the company has been exploring the foldable screen technology. Last month, an Apple patent titled Electronic Devices with Flexible Displays was published by the USPTO. The patent describes ways to prevent damage when the screen is folded and unfolded repeatedly. Apple’s patent points out that the foldable display has a higher risk of damage when the screen is cold, which makes it less flexible. The patent suggests heating the portion of the screen that folds and unfolds will dramatically reduce the risk. The display could be heated only when the device detects that it has been picked up or when it’s in use. There are two ways to heat the folding area of the screen – one of which is to apply maximum brightness to that area. Apple adds that the heating mechanism may not always work fast enough, and sometimes users might be forced to wait until it’s safe to fold the device. This might not be the perfect way to prevent damage, but it does show that Apple is interested in the foldable display technology. Recently, Korean publication ETNews reported that Samsung Display held talks with Apple to supply foldable displays for the future iPhones. Samsung already supplies OLED screens for the iPhone XS and XS Max. The displays sent by Samsung to Apple were 7.2-inch in size, only slightly smaller than the Galaxy Fold. Many experts had indicated that Samsung might not want to sell its foldable screens to Apple to maintain its dominance in the foldable phone market. Apple wouldn’t want to be left behind in this emerging trend. The Cupertino company’s decision to stick to the smaller form factor when the world was moving to phablets cost it dearly. It has already been dethroned by Huawei as the world’s second largest smartphone vendor, and Xiaomi is not far behind.